Play and learn with pumpkins this fall. 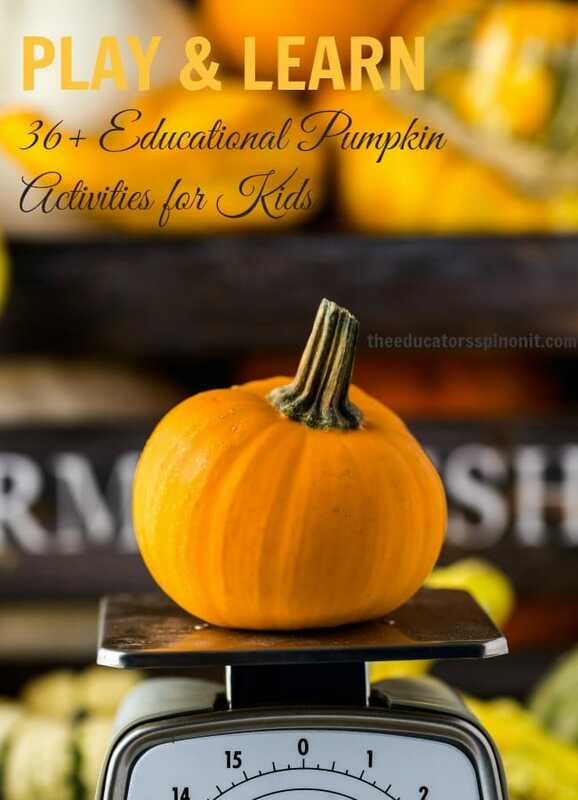 36+ Educational pumpkin activities for kids to teach math, science, and creativity. Put a number sticker on each pumpkin. Have the student’s line up the pumpkins in numerical order. Measure how tall and wide each pumpkin is. EASY: Use snap blocks to measure using non-standard forms of measurement. You can also use a ruler. Estimate how heavy the pumpkin is. Then, weigh the pumpkin with a kitchen scale. Double digit subtraction. Step on the scale. Write your weight down. Then step on the scale holding a pumpkin. Subtract the number to find out how much your pumpkin weighs. Count the number of lines on each pumpkin. Compare. Do the bigger pumpkins have more lines? Make a pumpkin pattern path. Use a string to measure the circumference of the pumpkin. Set the string down on a yard stick to measure how many inches around the circumference is. Make a chart with all your pumpkin circumferences. Estimation. Pull out a handful of seeds. Take a quick look, then estimate how many seeds you think there is. Count to check. Cut open a pumpkin. Remove the seeds. Have the children count how many. *hint* make groups of 5 or 10 to add in another math skill! Clean and dry the seeds. Use them on a 100 chart to make 100. Play Roll & Stamp Pumpkin Patch learning game. Make a pumpkin GEO board. Hammer golf tees into the pumpkin. Use rubber bands to create geometric shapes. Before carving the pumpkin, make choices. Allow children to vote on what they would like to see carved. Example. Triangle, circle, or square nose. Graph the results of the voting, then carve the one that received the most votes. Make a pumpkin catapult. Measure the distance the pumpkin pieces launch. Put a battery operated candle or flashlight in a pumpkin filled with holes. Turn the lights off and observe the lights and shadows. Create a pumpkin sensory bin. Set a pumpkin next to a paper outside. Trace the outside at different times during the day. Paint 3 pumpkins 3 different colors (making sure to use black for one) and set them in the sun. Observe the changes and discuss. Keep a journal of the pumpkin plant seed growth. Heat and property changes: use a hair dryer to melt crayons on pumpkins. Allow the pumpkin to decompose. Put stickers on the pumpkin. Let kids decorate the pumpkins with play dough. Cut a stem off the pumpkin and use it as a bowling ball for empty water bottles. Use potato head parts into holes. Make the holes by hammering golf tees in or with an electric drill. Cut pumpkins into chunks and let the kids stamp with it.